Create works of art while learning a traditional art form. Bright designs are printed on premium paper, then pre-cut into weaving strips. Kids will love weaving these projects, then displaying them or giving them away. 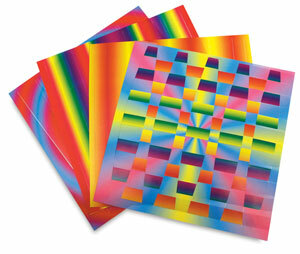 Rainbow Weaving Mats — This kit includes 72, 7" x 7" sheets in 12 different designs. An idea guide offers suggestions for rainbow quilts, moving sculptures, and "no-borders" weaving.